When people plan their Thanksgiving menu, salad often doesn’t make the cut. It’s understandable. I mean when you have 3 types of sweet potato dishes, a deep-fried turkey, and 6 variety of pies, where can you even find room for salad on the table? Salad just seems so everyday and unsubstantial compared to Thanksgiving’s heavy hitters. Why waste a coveted spot on your Thanksgiving line-up for raw greens? I totally get it, and this has been my Thanksgiving menu philosophy as well . . . that is until last year. I was meeting a friend for lunch at Darwin Cafe and saw that they had a kale salad on their menu. I love kale, but raw kale just didn’t have that much appeal to me. However the accompanying radicchio, lemon, garlic, parmesan, prosciutto, and aged balsamic helped win over my decision that day, and I will never ever forget the experience of eating that salad. I truly believe I reached some sort of culinary enlightenment that day and now understand, even seek to preach, that kale salads belong on Thanksgiving menus. The reason is kale salads are not like typical salads. They need time to brine and marinate, like a turkey. They feel substantive and hearty, like a Thanksgiving dish. 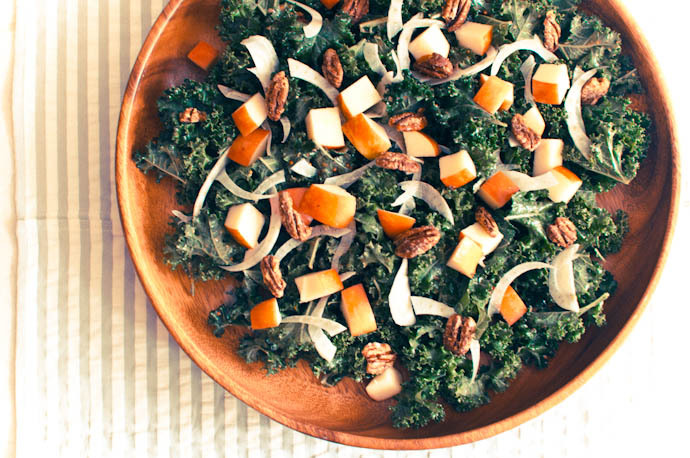 While a typical dressed salad doesn’t hold up over the many rounds of eating that inevitably happen on Thanksgiving day, a kale salad will. Last year an adaptation of Darwin Cafe’s kale salad ended up on the Thanksgiving table I shared with friends. It provided just the right relief from the richness of everything else without feeling out of place. Over this last year, I’ve continue to experiment with other versions, and the kale salad recipe below is my gift to your Thanksgiving menu. Tough kale leaves are broken down by a sweet & tart balsamic vinaigrette over the course of an hour (or night) in your fridge. The softened leaves are then complemented with crunchy apples, fennel, and candied pecans. Finally, the best part about the recipe below is that it has a place not only on your Thanksgiving menu but your everyday menu, because you won’t want to wait a full year to enjoy this again. This is part II in our “My Favorite Thanksgiving Sides” series. Read the first one for miso-butter roasted brussels sprouts here. Balsamic vinegar – 3 tbs. Dijon mustard – 1 tbs. Maple syrup – 1 tbs. Olive oil – 6 tbs.